This central region of Estonia has one of the highest number of children at risk of losing parental care. For this reason, SOS Children's Villages has been supporting families and children in Pöltsamaa since 2010. 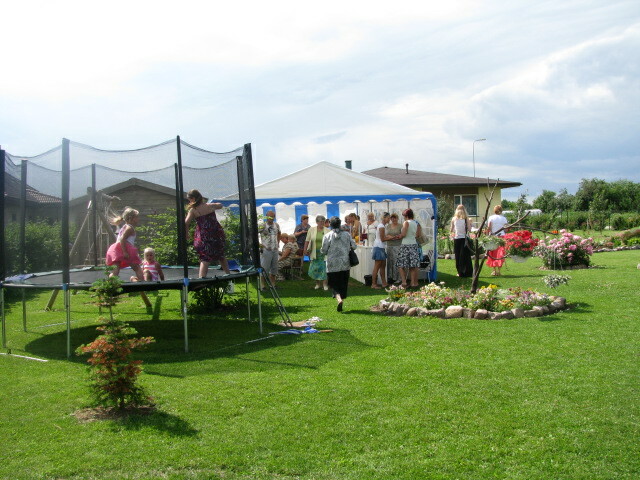 SOS families celebrating a local tradition - Gardens' Day- with the neighbours (photo: SOS archives). Pöltsamaa is located about 128 km to the south-east of the capital city of Tallinn. It is a small town, with about 4,800 inhabitants. The recent economic crisis has affected many families who live in the area. Although the government has invested in the region's development, many people continue to struggle. The recent increases in the price of food and other basic commodities have also had a negative impact on the lives of vulnerable families and children. Parents who do not have a job, or who are in irregular and badly-paid employment, often find it difficult to care for their children. Many have been forced to move to other areas of Estonia or abroad in search of work. Other children who are at risk of losing parental care include those who grow up in single-headed families or in households with substance abuse or health problems. Many of these children are malnourished and this, in combination with the other difficulties they face, often means that their physical and mental development is delayed or they experience behavioural difficulties. In some cases, children do not go to school because parents do not have enough money to cover the cost of the school uniform or learning materials. They are most likely not to attend school in winter, when families cannot afford snow-appropriate coats and shoes. These households are often socially isolated and they find it hard to get help to improve their lives. The local authorities know about the problems that many families face, and have planned measures to support them, but there is a lack of financial resources to carry them out at present. Families in need do receive some help from the state, but this does not address all their problems or make them self-sufficient. SOS Children's Villages works very closely with local government agencies, ensuring that children without parental care have access to the support they need. 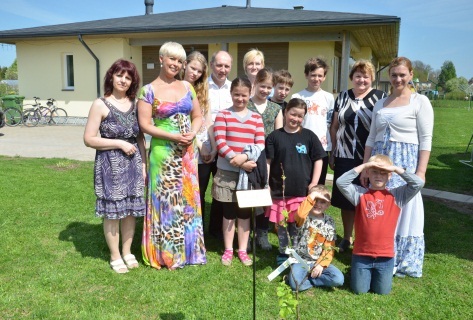 Some of the children in our care with Estonia's First Lady (photo: SOS archives). Children whose families can no longer take care of them can find a loving home in one of the three SOS families in Pöltsamaa. The SOS family homes are fully integrated into the community. They are located in a residential area of the town, and the children from the SOS families grow up alongside children from the neighbourhood, attending the same kindergartens and schools, and taking part in the local activities. A tailor-made "Child Development Plan" is drawn up in conjunction with the child; it is reviewed periodically and modified according to the changing needs of the child. When children are ready to leave their families they can join the SOS Youth Programmes in either Keila or in Tallinn. The young people live in special houses during their vocational training or further education and can prepare for an independent life under the guidance of care professionals.